Here is a scene that I really like, I saw this swan landing in the water yesterday. However, I am sad that the white plumage is so overexposed, and I was so far away that I had to crop too much and image quality suffered a lot. But anyway, I like the scene, the landing of the swan, and the water splash. I find it still very difficult to take photos of flying birds, my results are not always good, but I will get more experience over time I think. I had the camera in program mode when the swan was landing, and if I would have expected this swan, I would have set my camera manually, but now I didn’t have the time. None the less, really like the movement and excitement of this. 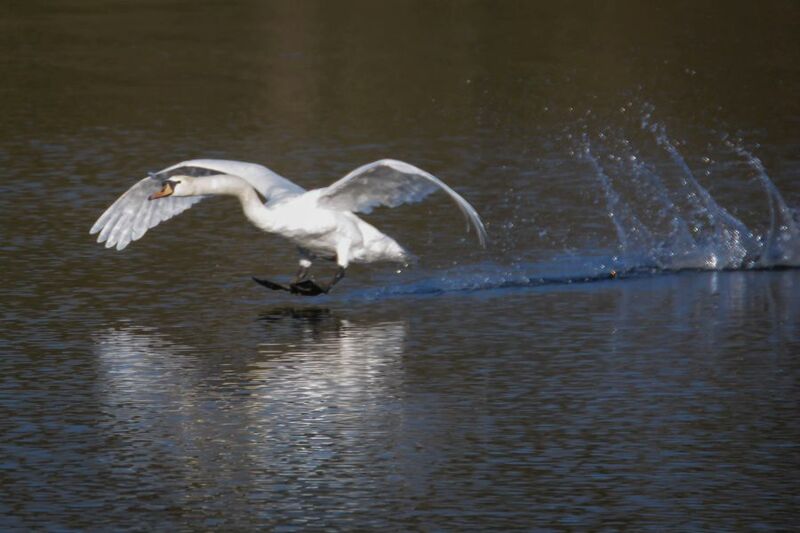 If they are like our local swans, then I reckon they get a great buzz out of being able to ski into land. Sometimes I think they look around to see who was watching and then wait for the accolades for their performance. I like the way you caught the plume of water as the swan landed. You can’t plan for such things you just have to react.